ensures a custom process for every user. Conditional logic is a huge part of Regpack’s unique registration software product. It is what gives Regpack’s software the ability to feel and be used like a custom software, without the high cost of customized software. “Conditional logic” creates a smooth and logical process for the applicant that is personalized for him. Conditional logic allows you to move applicants automatically between stages, show them the proper forms they need for their specific application and make the applicant feel as though you are right there with them when completing the application. 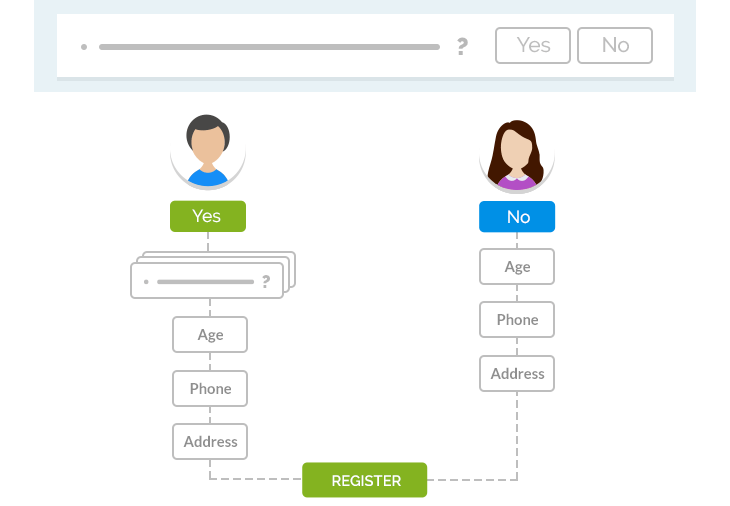 Using this type of logic for your registration process will also cut down on the admin time you spend guiding people individually to what forms they need to complete, calculating their balance and communicating due dates, etc. The online account dashboard created by a registration software will allow them to see what products they’ve chosen, any outstanding forms for those specific products and the balance of all of those products which means less phone calls and emails to you since the answer to their questions are right there! Scroll down to test our conditional logic system. Make signing legal documents easy with eSign built right into the application. Regpack was really helpful in building our system using conditional logic, so they were helpful to us in making those choices and we feel really good about what we have. Interested in learning more about how conditional logic can work for you?